Mirror, Mirror, on the Wall, Which State Has the Best Tax System of All? Yesterday, I wrote about the newest edition of Economic Freedom of the World, which is my favorite annual publication. Not far behind is the Tax Foundation’s State Business Tax Climate Index, which is sort of the domestic version of their equally fascinating (to a wonk) International Tax Competitiveness Index. And what can we learn from this year’s review of state tax policy? Plenty. …the specifics of a state’s tax structure matter greatly. The measure of total taxes paid is relevant, but other elements of a state tax system can also enhance or harm the competitiveness of a state’s business environment. 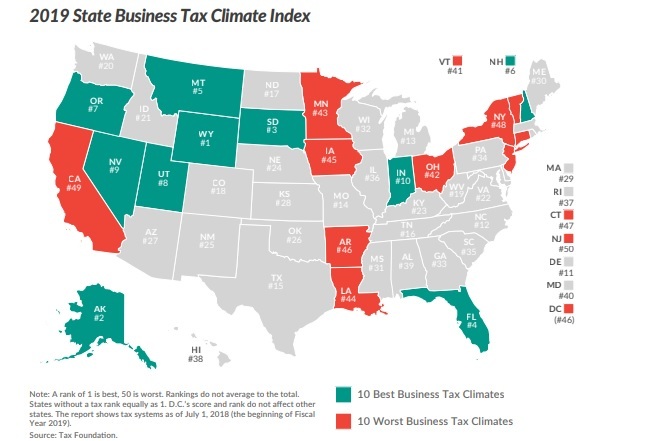 The State Business Tax Climate Index distills many complex considerations to an easy-to-understand ranking. That’s the theory, but what about the results? Here are the best and worst states. If you pay close attention, there’s a common thread for the best states. The absence of a major tax is a common factor among many of the top 10 states. …there are several states that do without one or more of the major taxes: the corporate income tax, the individual income tax, or the sales tax. Wyoming, Nevada, and South Dakota have no corporate or individual income tax (though Nevada imposes gross receipts taxes); Alaska has no individual income or state-level sales tax; Florida has no individual income tax; and New Hampshire, Montana, and Oregon have no sales tax. By the way, both Utah and Indiana are among the nine states with flat tax systems, so every top-10 state has at least one attractive feature. 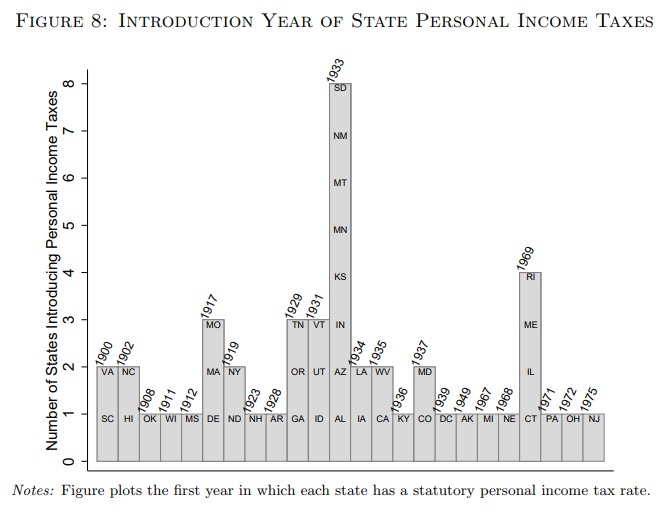 But if you peruse the bottom-10 states, you’ll find that every one of them has an income tax with “progressive” rates that punish people for contributing more to the economy. 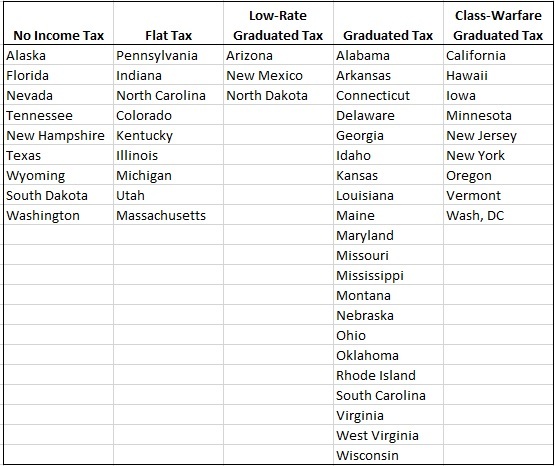 Indeed, half of the states on that unfortunate list are part of the “Class-Warfare Graduated Tax” club. Not a desirable group, assuming the goal is faster growth and more jobs. The Tax Foundation’s report also is worth reading because it reviews some of the academic evidence about the superiority of pro-growth tax systems. Helms (1985) and Bartik (1985) put forth forceful arguments based on empirical research that taxes guide business decisions. Helms concluded that a state’s ability to attract, retain, and encourage business activity is significantly affected by its pattern of taxation. Furthermore, tax increases significantly retard economic growth when the revenue is used to fund transfer payments. Bartik concluded that the conventional view that state and local taxes have little effect on business is false. Papke and Papke (1986) found that tax differentials among locations may be an important business location factor, concluding that consistently high business taxes can represent a hindrance to the location of industry. 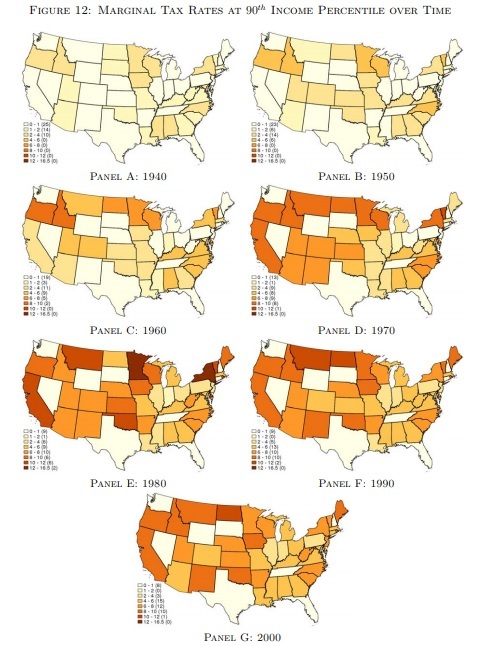 …Agostini and Tulayasathien (2001) examined the effects of corporate income taxes on the location of foreign direct investment in U.S. states. They determined that for “foreign investors, the corporate tax rate is the most relevant tax in their investment decision.” Therefore, they found that foreign direct investment was quite sensitive to states’ corporate tax rates. Mark, McGuire, and Papke (2000) found that taxes are a statistically significant factor in private-sector job growth. Specifically, they found that personal property taxes and sales taxes have economically large negative effects on the annual growth of private employment. …Gupta and Hofmann (2003) regressed capital expenditures against a variety of factors… Their model covered 14 years of data and determined that firms tend to locate property in states where they are subject to lower income tax burdens. None of this research should come as a surprise. Businesses aren’t moving from California to Texas because business executives prefer heat and humidity over ocean and mountains. The bottom line is that tax rates matter, whether we’re looking at state data, national data, or international data. Let’s close by sharing a map from the report. Simply stated, red is bad and teal (or whatever that color is) is good. P.S. My one complaint about this report from the Tax Foundation is that it doesn’t include the overall fiscal burden. Alaska and Wyoming score well because they have small populations and easily fund much of their (extravagant) state budgets with energy-related taxes. If data on the burden of state government spending was included, South Dakota would be the best state. P.P.S. Unsurprisingly, Americans are moving from high-tax states to low-tax states. P.P.P.S. It’s also no surprise to find New Jersey in last place. Assuming elected officials care about the consequences of their actions, the obvious answer to a question isn’t always the right answer. Q: Why should a (sensible) politician oppose the minimum wage, especially since some workers will get a pay hike? A: Because the bottom rungs of the economic ladder will disappear and marginally skilled people will lose a chance to find employment and develop work skills. Q: Why should a (sensible) politician oppose so-called employment-protection legislation, especially since some employees will be protected from dismissal? A: Because employers will be less likely to hire workers if they don’t have the freedom to fire them if circumstances change. Q: Why should a (sensible) politician oppose class-warfare taxation, especially since they could redistribute money to 90 percent of voters? A: Because the short-run benefits of buying votes will be offset by long-run damage to investment, competitiveness, and job creation. Many politicians are not sensible, of course, which is why bad policy is so common. So it’s worth noting when someone actually makes the right decision, especially if they do it for the right reason. With that in mind, President Emmanuel Macron deserves praise for gutting his country’s punitive “exit tax.” The U.K.-based Financial Times has the key details. French president Emmanuel Macron said that he would remove the so-called exit tax as it was damaging for France’s image as a place to do business. The tax requires those entrepreneurs or investors who hold more than €800,000 in financial assets or at least 50 per cent of a company to pay capital gains up to 15 years after leaving France. …A finance ministry spokesperson on Saturday confirmed “the removal of the exit tax as it existed.” …”The exit tax sends a negative message to entrepreneurs in France, more than to investors. Why? Because it means that beyond a certain threshold, you are penalised if you leave,” Mr Macron had said… “I don’t want any exit tax. It doesn’t make sense. People are free to invest where they want. I mean, if you are able to attract [investment], good for you, but if not, one should be free to divorce,” added the French president. Kudos to Macron. He not only points out that such a tax discourages investment and entrepreneurship, but he also makes the moral argument that people should be free to leave a jurisdiction that mistreats them. To be sure, the proposal isn’t perfect. Mr Macron has now decided to introduce a new “anti-abuse” tax targeted at assets sold within two years of someone leaving the country. …“The new system will henceforth target divestments occurring shortly after leaving France — two years — to avoid letting people make short trips abroad in order to optimise tax efficiencies,” added the spokesperson. This is why I gave the plan two-plus cheers instead of three cheers. Though I understand the political calculation. It would create a lot of controversy if a rich person moved for one year to one of the several European nations that have no capital gains tax (Netherlands, Belgium, Switzerland, etc), sold their assets, and then immediately moved back to France the following year. The right policy, needless to say, is for there to be no capital gains tax, period. But let’s not get sidetracked. Here are a few additional details from Reuters. France imposed the so-called “Exit Tax” in 2011 during the presidency of Nicolas Sarkozy. …Its aim was to stop individuals temporarily changing their tax domicile in order to skirt French taxes but pro-business President Emmanuel Macron says it damages France’s attractiveness as an investment destination. Yes, you read correctly, the class-warfare policy wasn’t imposed by the hard-left Francois Hollande, but by the Nicolas Sarkozy, the supposed conservative but de-facto leftist who preceded him. What’s particularly bizarre is that Macron was a senior official for Hollande, yet he is the pro-market reformer who is trying to save France. P.S. I’m embarrassed to admit that the United States has a very punitive exit tax (which Hillary Clinton wanted to make even worse). P.P.S. Since one of my three examples at the beginning of today’s column dealt with the perverse consequences of “employment-protection laws,” I suppose it’s worth noting that’s another area where Macron is trying to reduce government intervention. P.P.P.S. While Macron is a pro-market reformer at the national level, he advocates very bad ideas for the European Union. With the possible exception of a few extreme environmentalists, everyone agrees that robust long-run growth is a key to a better society. An unprecedented jump in growth, for instance, is what enabled the western world to escape poverty, resulting in the famous “hockey stick” of modern prosperity. Maintaining growth is an ongoing challenge for developed countries, to be sure, and it’s also vitally important to help developing nations grow and prosper. Which is why policymakers should focus on the policies that generate good outcomes. Libek, a think tank in Serbia, has released a study on this topic. They start by pointing out that we now have some good measures of economic liberty in various nations. …the Economic Freedom in the World Index in 1996 by the Fraser Institute…was the first methodological tool that measured intrusion in functioning of the market process by government entities, either directly through government intervention or indirectly though regulation and market institutions. A similar index, Index of Economic Freedom, produced by the Wall Street Journal and the Heritage Foundation soon followed… Since this very successful tool was invented, it has been widely employed in empirical studies…, the most important were concerning the role of economic freedom in fostering economic growth. …empirical studies mostly concluded that there is a significant connection between economic freedom and economic growth. Since I’m always citing the Fraser Index and the Heritage Index, I agree that these are very helpful sources of data. And lots of academics also use those numbers. So Libek took a close look at this wealth of empirical research. Libek conducted a metastudy regarding economic freedom in December 2017, with the aim to reexamine the connection between economic freedom and economic growth in published empirical studies. 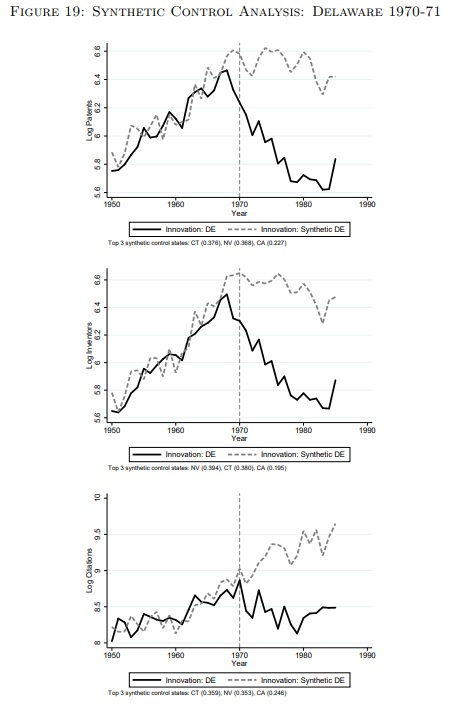 …Using Google scholar mechanism…92 studies…consider the connection between economic freedom and economic growth. Out of these, a predominant majority of 86 studies (93.5%) finds a positive correlation or connection between them, while only 6 studies (6.5%) have less positive results. …This metastudy shows that empirical studies have predominantly found that economic freedom is associated with higher economic growth rates, while there is only one study claim otherwise and results of other 5 are less conclusive. This high rate of concurrence between economists is highly unusual, given the fact that economist tend to often disagree even among theoretically more accepted topics. Therefore, it is conclusively shown that higher level of economic freedom, ceteris paribus, leads to higher economic growth. The folks at Libek have a big incentive to care about these issues because Serbia is a reform laggard. Here’s a chart comparing economic freedom in Serbia with other European regions. And here is why economic reform is so vitally important for the people of Serbia. Serbia remains one of the poorest countries in Europe, measured by GDP, with just 5 000 euros per capita. These low growth rates do not provide a possibility for development and closing the gap with more advanced European economies. …A study estimated future economic gains through higher economic freedom (Gwartney and Lawson 2004) reporting that 1-point increase in economic freedom (measured on a 1 to 10 scale) would increase long term rate of economic growth for 1.24% of GDP. Therefore, if Serbia would increase its score from the current 6.75 to 7.75 points – the approximately current level of Austria or Germany, Serbian long-term growth rate would increase from the envisaged 2% in 2017 (and estimated by the IMF to stand at 3.5% in 2018 and 2019) to 5.25% in 2020 and afterwards. This growth rate would enable a fast income convergence with other European countries, with GDP level per capita doubling in 14 years. Amen. Serbia has the capacity to “converge,” but that won’t happen without economic liberalization. For non-Serbians, the parts of the Libek report that will be of greatest interest deal with examples of nations that are out-performing their neighbors. The importance of economic freedom is well shown by the most important case studies from different continents: Chile (South America), Singapore and Korea (East Asia), and Botswana (Africa). In all these prominent cases, economic freedom propelled these societies to a high and sustainable economic growth which led them to prosperity, compared to their neighbors. The report specifically looks at the long-run data for countries that have sharply diverged from regional competitors. Let’s start by comparing Chile with the rest of South America. 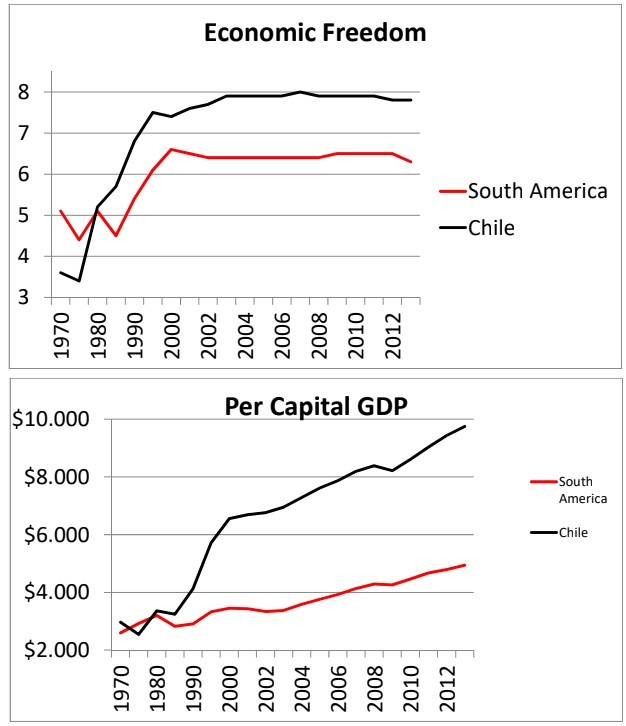 As you can see, Chile’s dramatic economic liberalization led to far higher levels of national prosperity. 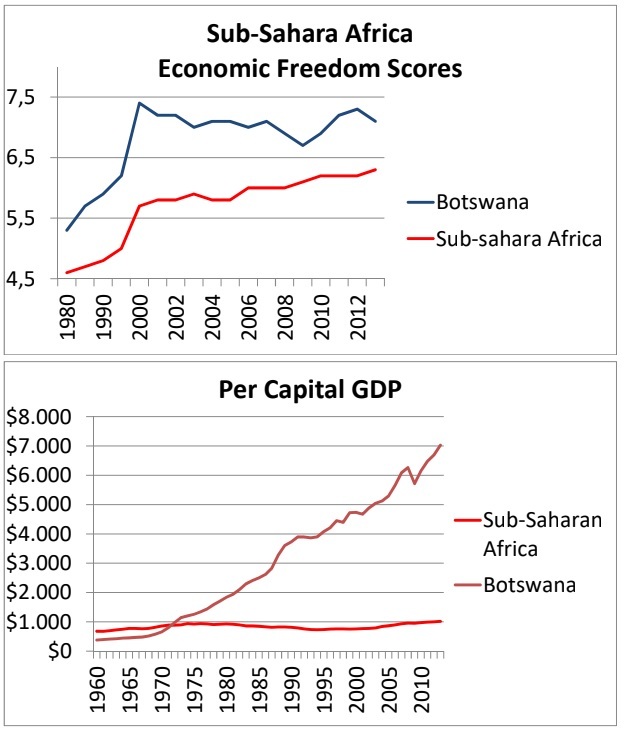 Now let’s compare Botswana to the rest of Sub-Saharan Africa. I did something similar back in 2015 and also earlier this year, so this remarkable data is impressive but not surprising. 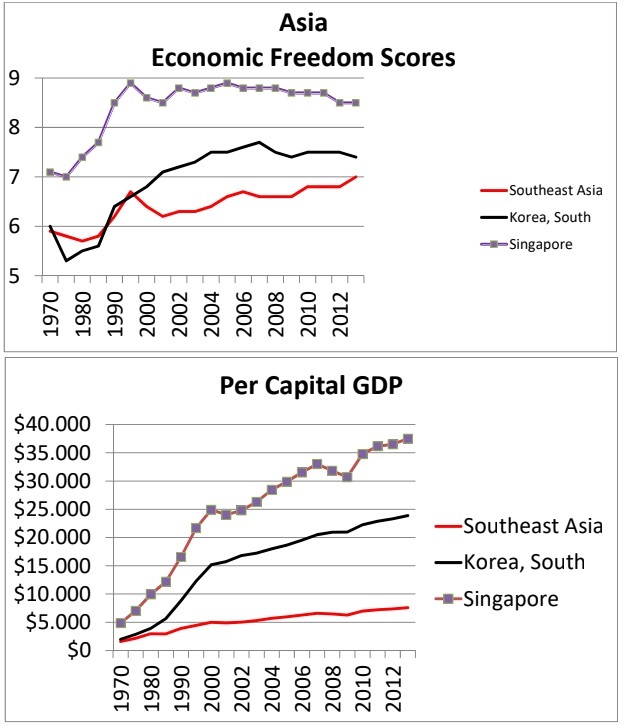 Last but not least, let’s compare Singapore and South Korea to their neighbors. Once again, we see a compelling link between economic liberty and economic outcomes. This is dramatically evident when comparing South Korea and North Korea, but you also see remarkable numbers when comparing Singapore with the United States. The lesson is not that nations need perfect policy (even Hong Kong has some statism). Instead, the message is that governments should strive to increase economic liberty – hopefully in big ways but even small reforms are helpful – so that there’s more “breathing room” for the economy’s productive sector. Now I have something even better because it confirms my hypothesis about tax competition being the most effective way of constraining greedy politicians. To set the stage, check out these excerpts from a heartwarming story in the Wall Street Journal. Last year’s corporate tax cut is reducing U.S. tax collections, as expected. But that change is likely to ripple far beyond the country’s borders in the years ahead, shrinking other countries’ tax revenue… The U.S. tax law will reduce what other countries collect from multinational corporations by 1.6% to 13.5%… Companies will be more likely to put profits and real investment in the U.S. than they were before the U.S. lowered its corporate tax rate from 35% to 21%, according to the paper. That will leave fewer corporate profits for other countries to tax. And as that happens, other countries are likely to chase the U.S. by lowering their corporate tax rates, too, creating the potential for what critics have called a race to the bottom. …Mexico, Japan and the U.K. rank near the top of the paper’s list of countries likely to lose revenue… Corporate tax rates steadily declined over the past few decades as countries competed to attract investment. Amen. This was one of my main arguments last year for the Trump tax plan. Lower tax rates in America will lead to lower taxes elsewhere. For instance, look at what’s now happening in Germany. Ever since Donald Trump last year unveiled deep tax cuts for companies in America, German industry has been wracked with fears over the economic fallout. …“In the long term, Germany cannot afford to have a higher tax burden than other countries,” warned Monika Wünnemann, a tax specialist at German business federation BDI. …the BDI urges Berlin to cut the overall tax burden, including corporate and trade levies, to a maximum 25 percent, compared to 26 percent in the US. …tax competition has clearly heated up within the European Union: France plans to reduce its top corporate rate to 25 percent by 2022 from 34 percent. The UK wants to cut its rate to 17 percent by 2021 from 20 percent today. If it fails to take action, Germany will be stuck with the heaviest corporate tax burden among industrialized countries. Now let’s peruse a recent study from the International Monetary Fund. Tax competition and declining corporate income tax (CIT) rates are not new phenomena. However, over the past 30 years, the United States has been an outlier in not reducing tax rates Combined with the worldwide system of taxation, this is widely regarded as having served as an anchor to world CIT rates. Now the United States has cut its rate by 14 percentage points to 26 percent (21 percent excluding state taxes), which is close to the OECD member average of 24 percent (Figure 1). Combined with the (partial) shift toward territoriality, this may intensify tax competition. …Given the combination of highly mobile capital and source-based corporate income taxation, pressures on tax systems are not surprising. …The most clear-cut, and possibly largest, spillovers are still likely to be caused by the cut in the tax rate. …Depending on parameter assumptions, we find that reform will lead to average revenue losses of between 1.5 and 13.5 percent of the MNE tax base. …The paper has also discussed the likely policy reactions of other countries. …tax rates elsewhere also fall (by on average around 4 percentage points based on tentative estimates). And here’s the chart from the IMF report that sends a thrill up my leg. 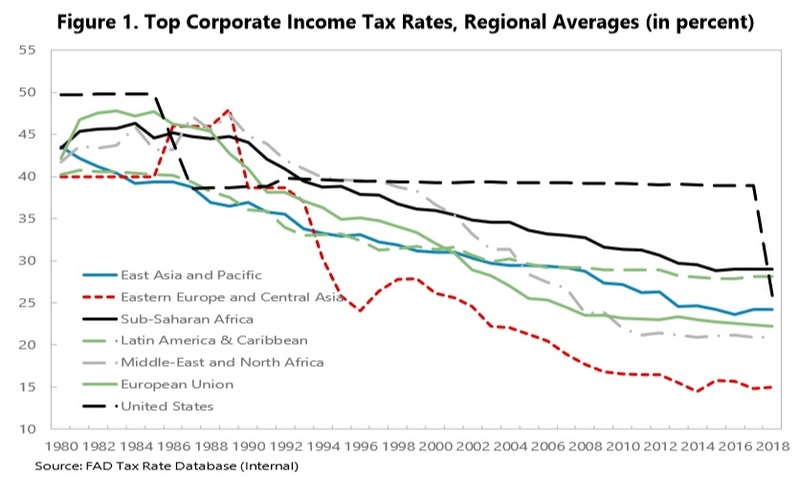 As you can see, corporate tax rates have plunged by half since 1980. And the reason this fills me with joy is two-fold. First, we get more growth, more jobs, and higher wages when corporate rates fall. Second, I’m delighted because I know politicians hate to lower tax rates. Indeed, they’ve tasked the OECD with trying to block corporate tax competition (fortunately the bureaucrats haven’t been very successful). And I could add a third reason. The IMF confesses that we have even more evidence of the Laffer Curve. So far, despite falling tax rates, CIT revenues have held up relatively well. I’m very irked by what Trump is doing on trade, government spending, and cronyism, but I give credit where credit is due. I suspect none of the other Republicans who ran in 2016 would have brought the federal corporate tax rate all the way down to 21 percent. And I’m immensely enjoying how politicians in other nations feel pressure to do likewise. Shortly after the fiscal crisis began in Greece, I explained that the country got in trouble because of too much government spending. More specifically, I pointed out that the country was violating my Golden Rule, which meant that the burden of spending was rising relative to the private economy. That’s a recipe for trouble. Unfortunately, thanks in large part to bad advice from the International Monetary Fund, Greek politicians decided to deal with an overspending problem by raising taxes. And raising taxes some more. Then adding further tax hikes. The tax burden is now so stifling that even the IMF admits the country may be on the wrong side of the Laffer Curve. And establishment media sources are noticing. Here are some excerpts from a report in the Wall Street Journal. Greece is…raising taxes so high that they are strangling the small businesses that form the backbone of its economy. …The tax increases have left Greece with some of Europe’s highest tax rates across several categories, including 29% on corporate income, 15% on dividends, and 24% on value-added tax (a rough equivalent of U.S. sales tax). Individuals pay as much as 45% income tax, plus an extra “solidarity levy” of up to 10%. Furthermore, workers and employers pay social-security levies of up to 27% of their salaries. …small and midsize businesses and self-employed people…are fighting the government in court over having to pay what they say is up to 80% of their average monthly takings in taxes and levies. Some also have to pay retroactive social-security contributions, to the point where professional associations say some of their members are having to pay more to the state than they make. Paying more than they make? Francois Hollande will applaud when he learns that another nation has an Obama-style flat tax. Of course the state hasn’t been made more efficient. Why would politicians shrink government if higher taxes are an option? It’s not as if Greek voters are poised to elect a Ronald Reagan or Margaret Thatcher, after all. In any event, all of the tax increases are having predictably bad effects. Why “try to do more” when the government gets the lion’s share of any additional income? And why even stay in the country when there are better (less worse) tax systems in neighboring nations? Indeed, Greece is one of the few nations to raise corporate tax rates as the rest of the world is taking the opposite approach. Here are some of the details. It appears that Bulgaria is a preferred destination for tax exiles. In other words, the problem is tax rates, not tax evasion. Lower the rates and evasion falls. Let’s wrap up today’s column with a final observation. The WSJ story states that there have been spending cuts in addition to tax increases. That’s basically true, but net effect of the Greek fiscal crisis is that government has become a bigger burden, relative to private economic output. Here’s a chart, based on data from the IMF. 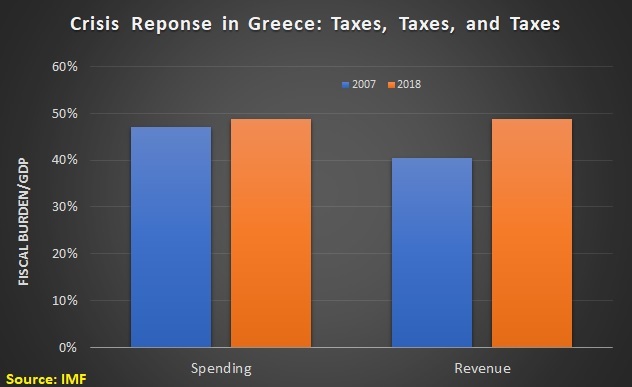 The bottom line is that Greek politicians did way too much spending last decade and now they’re augmenting that mistake with way too much taxing this decade. P.S. To reward everyone who read to the end, here’s some Greek-related humor. This cartoon is quite good, but this this one is my favorite. And the final cartoon in this post also has a Greek theme. We also have a couple of videos. The first one features a video about…well, I’m not sure, but we’ll call it a European romantic comedy and the second one features a Greek comic pontificating about Germany. Last but not least, here are some very un-PC maps of how various peoples – including the Greeks – view different European nations. Speaking of stereotypes, the Greeks are in a tight race with the Italians and Germans for being considered untrustworthy. P.P.S. If you want some unintentional humor, did you know that Greece subsidizes pedophiles and requires stool samples to set up online companies? I’ve been in China this week, giving lectures about economic policy at Northeastern University in Shenyang. I’ve explained that China has enjoyed reasonably impressive growth in recent decades thanks to pro-market reforms. But I’ve also pointed out that further economic liberalization is needed if China wants to avoid the middle-income trap. That won’t be easy. Simply stated, I don’t think it’s possible to become a rich nation without free markets and small government. 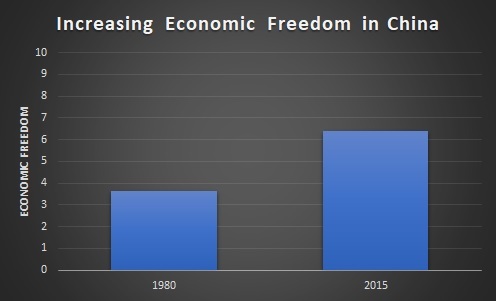 The good news is that China’s economic freedom score has increased dramatically since reforms began, rising from 3.64 in 1980 to 6.40 in the latest edition of Economic Freedom of the World. And there’s been a dramatic increase in prosperity and a dramatic reduction in poverty. The bad news is that a score of 6.40 means that China is only ranked #112 in the world. That’s way too low. The country needs a new burst of pro-market reform (especially since it also faces serious demographic challenges in the not-too-distant future). 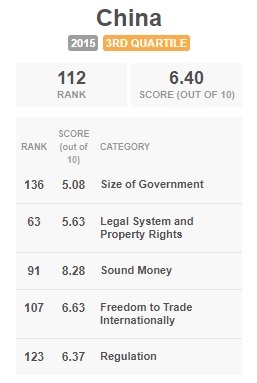 In other words, China should strive to be more like #1 Hong Kong, which has a score of 8.97, or #4 Switzerland, with a score of 8.44. Or even the #11 United States, which has a score of 7.94, or also #19 Netherlands, with a score of 7.74. The bottom line is that China won’t become a rich nation so long as it has a score of 6.40 and a ranking of #112. Fortunately, there is a pre-existing recipe for growth and prosperity. China needs to change the various policies that undermine competitiveness. Since I’m a public finance economist, I told the students how China’s fiscal score (“size of government”) could be improved. I recommended a spending cap, of course, but I also said the tax system needed reform to enable more prosperity. Part of tax reform is low marginal tax rates on productive behavior. Chinese academic experts agree. As reported by the South China Morning Post, they’re urging the government to significantly reduce the top rate of the personal income tax. China needs to slash its highest tax levy on the nation’s top income earners in its upcoming individual tax code review, or risk seeing an unprecedented talent exodus, argued eight academics… They called for authorities to scrap the top two tax brackets of 35 per cent and 45 per cent in the current seven brackets progressive tax system on individuals, granting high income earners more leeway with a five tax brackets system that will be capped at 30 per cent. The scholars pointed out that high tax rates are especially harmful in a world where high-skilled people have considerable labor mobility. The academics from esteemed mainland universities called for further revision of the code, as the current draft failed…high income earners, a group that is often highly skilled professionals China wants to attract and retain in the global fight for talent. …For the “highly intelligent groups”, remunerations and royalties were likely to surpass the monthly salary, meaning that the combination can add up to a higher taxable income base and “seriously restrain them from” pursuing innovation, the academics argued. “In a global environment [when tax cuts become mainstream], if China maintains its high individual income tax rates … it will push the high-income, high-intelligent group overseas,” they said. Needless to say, I’ll be very curious to see what happens. I’ve now been to China several times and I think the country has huge potential. But achieving that potential requires reforms that will reduce the size and scope of government. 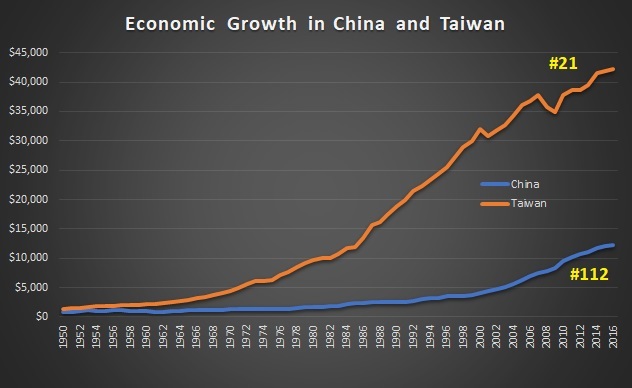 Here’s a chart I shared with the students, which shows that Taiwan has much more economic freedom and is much richer (basically an updated version of some numbers I put together in 2014). The bottom line is that the country can become a genuine “Chinese Tiger” rather than a “paper tiger” with the right policies. P.S. Some people actually think China should become more statist. Both the Organization for Economic Cooperation and Development and the International Monetary Fund have urged staggering tax increases in China.